Hello there! Say what? It’s nearly December! I’m back with a third edition of my explore tubs! You can catch up on my preview two posts Set One HERE and Set Two HERE. 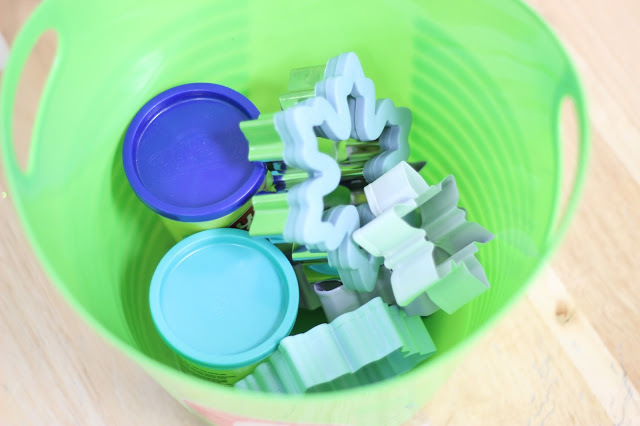 I am using my explore tubs as a way to make fine motor a constant in our classroom… not just something we work on the first couple weeks of school! When do I use my explore tubs? I have explore tubs as an option during daily five! I assign my students to their daily fives so my kiddos go to explore 1-2 times per week or possibly more if they are a kiddo that needs it! When else could you use explore tubs? A lot of my readers are using explore tubs during option time and morning work! This edition of explore tubs will be winter/Christmas themed and ALL of the explore tubs I will be share are freebies! Woohoo! Let’s get started! 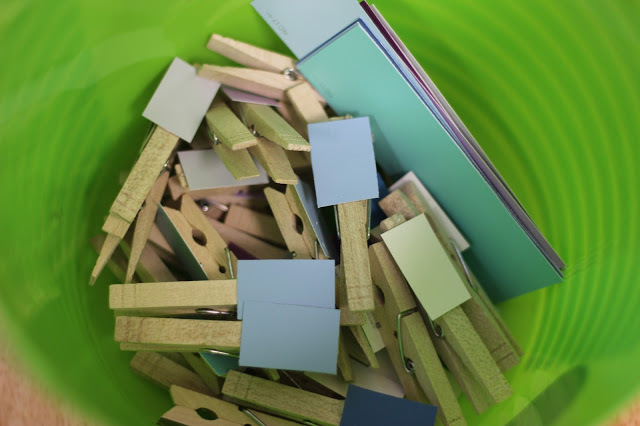 Tub One: Paint chip match-ups! I absolutely love this fine motor center! I snagged a few larger paint samples and cut them right down the middle creating to large rectangles! I then cut one of the rectangles into much smaller pieces and hot-glued them onto clothes pins! 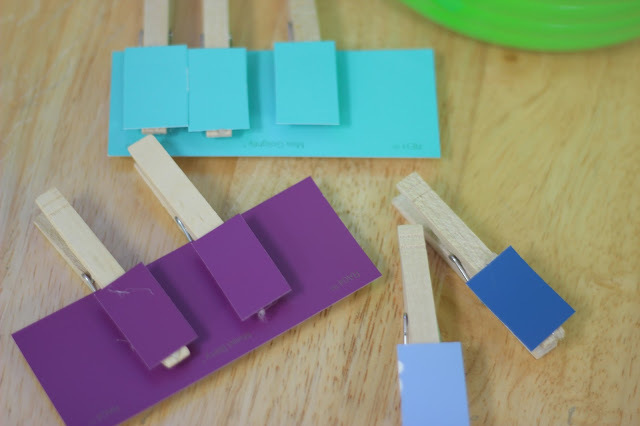 The kiddos will be building up those finger muscles by placing the matching clothes pins to the larger paint sample! 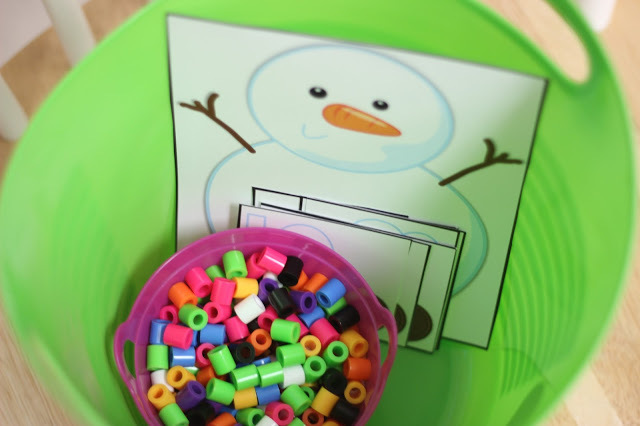 Tub Two: This explore tub integrates some fine motor AND math into one! 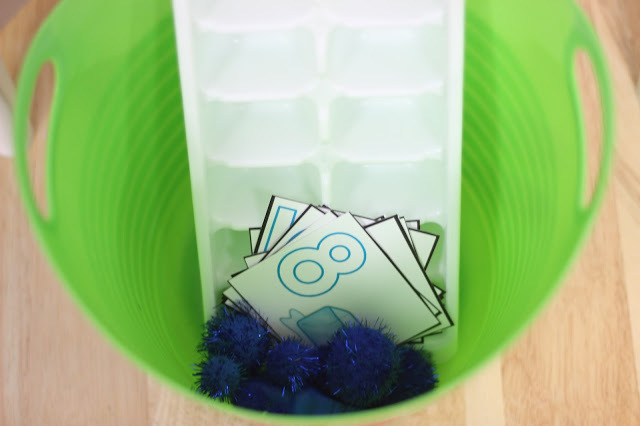 For this tub the kiddos will have the larger polar bear/ice mat and then numeral cards. You can use fuzzy pom-poms or I purchased these little plastic gems from amazon but Walmart has them as well! 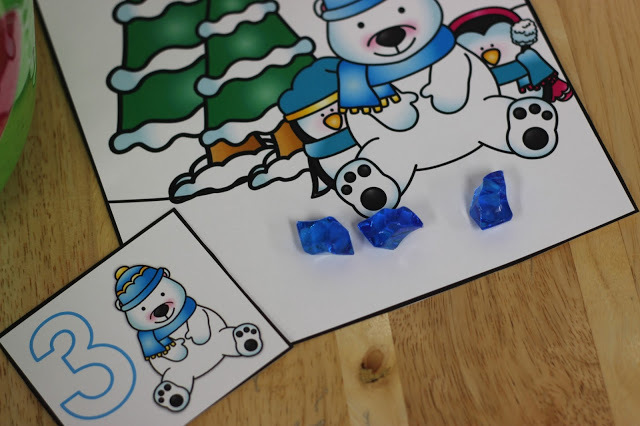 The kiddos will view the number on the card and place that many matching gems onto the ice mat! For this explore tub you could use the fine motor pincers but I am having the kiddos use a “scoop and tuck” fine motor exercise. For this the kids will grab on gem at a time and if the number is 6 they will have to keep the other five tucked in their palms and then place all 6 on the mat at one time! This is tricky and will need modeled! This explore tub will be part of the freebies which can be downloaded here! Tub Three: Tub three is a classic but still so much fun! 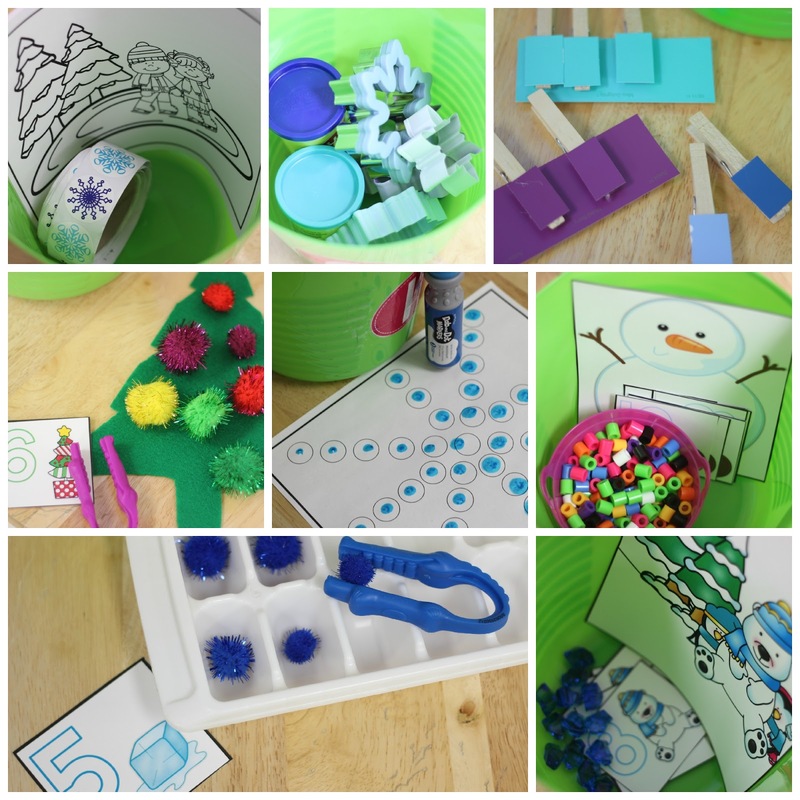 For this explore tub I placed an ice tray, blue fuzzy pom-poms, fine motor tweezers, and matching ice numeral cards into the bucket! 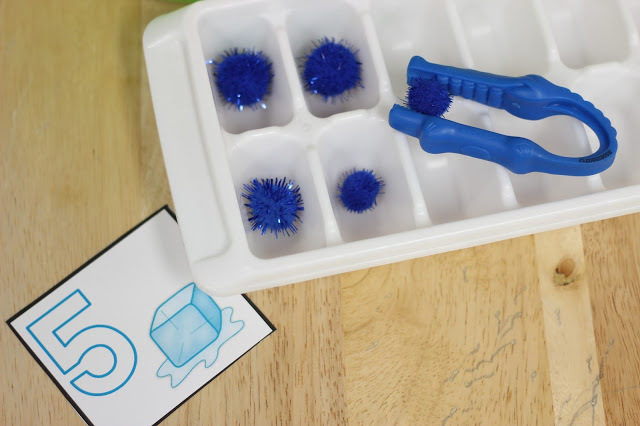 The kiddos will view the number then pinch that many “ice cubes” and place them into the ice tray! You can download the cards along with the freebie download! Tub Four: This explore tub is for sure a HOOT! 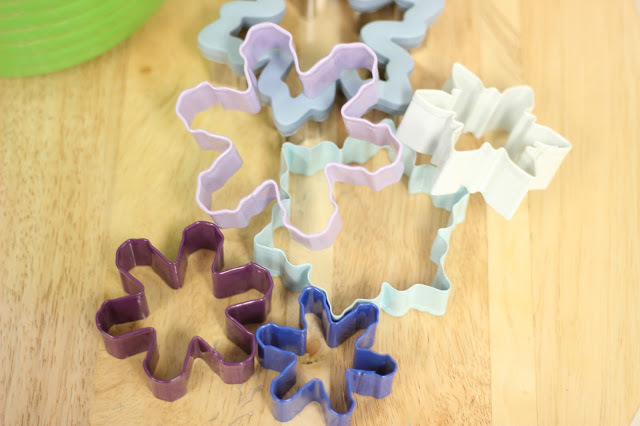 I purchased the first snowflake cookie cutter on Amazon, but then found the smaller and perfect cookie cutters at Walmart in a set for around $5! Play-doh is the token of all tokens in my room right now so they’ll flip! 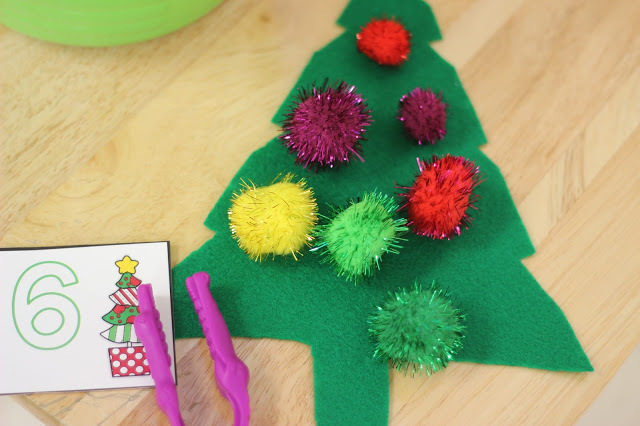 Tub Five: Tub five contains a felt Christmas tree, fuzzy pom-poms, fine motor tweezers, and numeral cards! 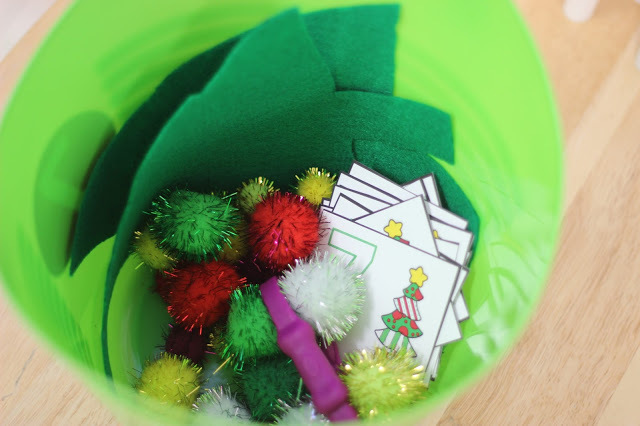 For this explore tub the students will view the numeral card and use the fine motor tweezers to grab that many pom-poms! I purchased the felt at walmart for $0.23 and my husband cut it for me #letsgetreal ha! 🙂 The numeral cards are also part of the freebie download! Tub Six: This explore tub is another fun one! 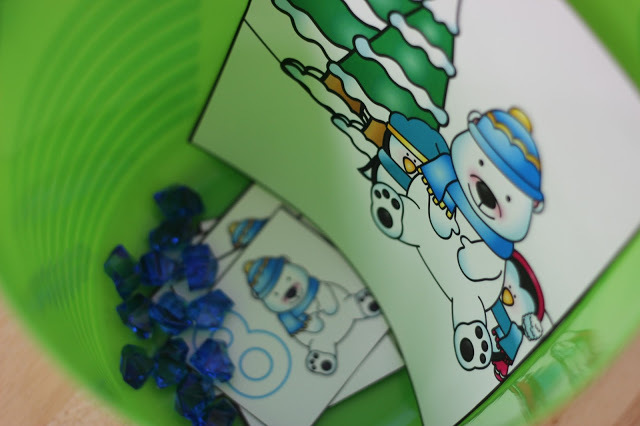 The students will have the larger snowman card, numeral cards, and perler beads! 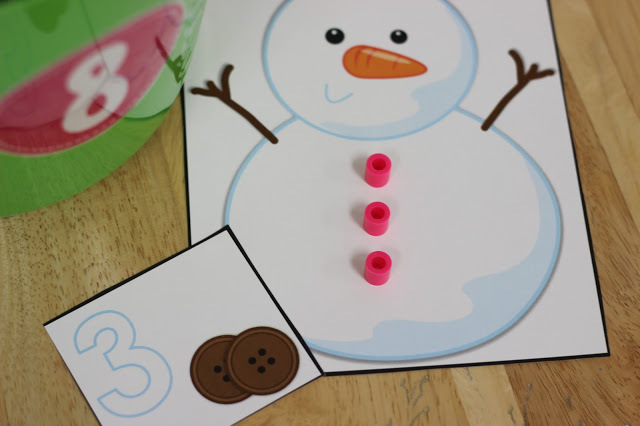 The students will view the numeral cards and the use their little pincher fingers to place that many perler beads onto the snowman mat! This too is part of the freebie download! Tub Seven: Tub seven is a little out of my comfort zone, but I think it will be just fine for these “special” winter months! 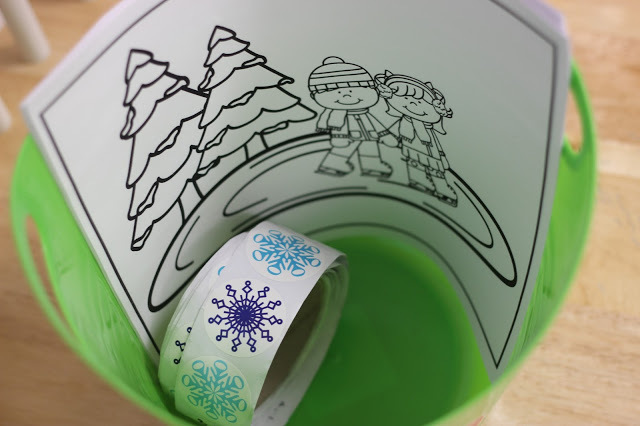 For this explore tubs the kiddos will be able to place snowy stickers onto their scenery picture and then color! 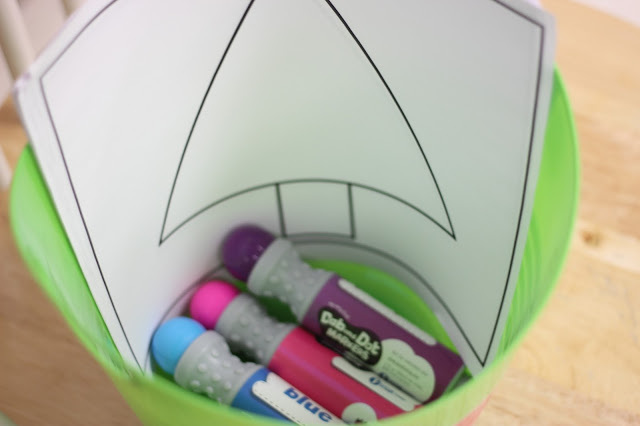 I really didn’t want this to just be a coloring explore tub, but then I also feel the kids DO need a time where they can just color for fun as well! 😉 I purchased these stickers from Amazon 300 stickers for $8. I’ve included three free scenery pictures in the download! Tub Eight: Tub eight includes dabbers! Yay! HA!!!! That wasn’t sarcasm 😉 or was it!? 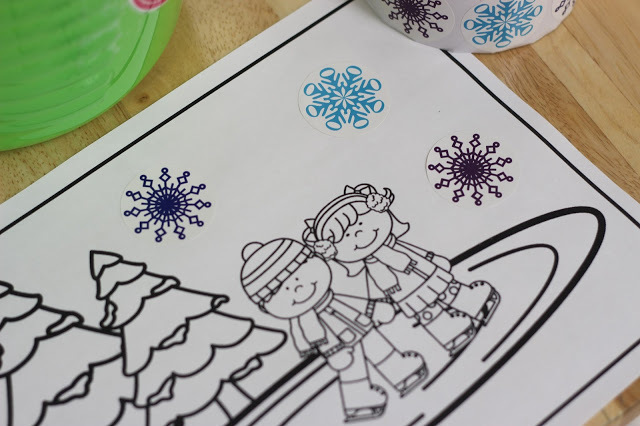 For this explore tub the kiddos will be able to use the templates and dabbers to create beautiful masterpieces! Again, all of the printables I shared above are part of THIS freebie download! I hope you loved the ideas and goodies! Have a great week! Thanks for sharing so many of these. I will be checking what I already have for Christmas and winter themes to see which I should print out. Thank you! These will be great that last week before Christmas when everything is crazy!! They will LOVE these! Your explore tubs are my students FAVORITE thing that we do in the classroom! I love love love that you are sharing your ideas for these. THANK YOU!!!! Wahoo! I was just thinking last night I wonder if Tara is going to do more explore tubs and then you post!!! Thank you so much for such fabulous ideas and freebies! Thanks! Where do you keep the materials for the other tubs when you're not using them? I'm having a terrible time storing the others since I have absolutely no storage! Thank you! Such awesome ideas! I've been patiently waiting for a new blog post about explore tubs #3! My kinders LOVE your explore tubs! Thank you so much for making them a freebie! I can't wait to make them. Thank you so much for all that you do. We love so many of your ideas and products! I LOVE these fine motor tub ideas! I couldn't WAIT for your next explore tubs post! Thank you for sharing and my students LOVE them!!! 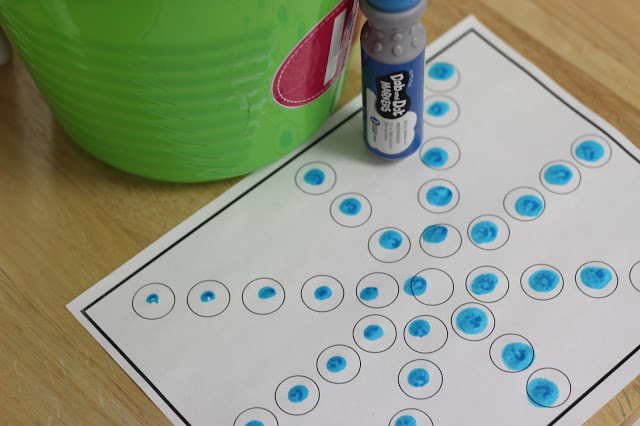 These are so perfect for fine motor – such a big problem in my room! Thank you so much for the freebies! Do you use theses explore tubs year long? I am new to Kindergarten and thinking about using them, but would like more information.